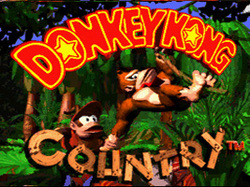 This is the first game in the marvelous Donkey Kong Country series. It has a strange link to the old Donkey Kong arcade games too; the Donkey Kong of those games is now the Cranky Kong of these games and he has retired. The storyline of the game is quite basic: King K. Rool has had his Kremlings steal Donkey Kong’s hoard of bananas, so he, along with his nephew Diddy, head out to retrieve the bananas and to defeat K. Rool (with help from other members of the Kong family along the way). Really, the minimal story is no bad point, it’s just a quick set up for a highly enjoyable adventure! You play the game by walking across a large world map and winning each of the levels you get to. There is a big variety in the different types of level (jungles, temples, forests, caves, etc) and the graphic style makes all of them look very nice indeed. The different levels will also present you with different gameplay styles: sometimes you’ll be slowly exploring the jungle and looking for secrets, others you’ll be quickly riding through mines in mine carts, and others still you’ll be swimming around avoiding fish at the bottom of the ocean. All these amazing levels are made even better thanks to the game’s outstanding soundtrack, which really emphasises the naturalistic style of the game. What’s also a lovely addition, is the fact that there are several ‘Animal Buddies’ who you can ride and will help you to win the levels (such as Rambi the Rhino and Winky the Frog) which also adds some gameplay variation. There are also boss fights to do every so often, usually against a giant version of a regular enemy, and luckily, these never tend to get too hard. You’re also given the option of multiplayer: you can have one player be Donkey Kong and the other Diddy Kong and when one person dies the other person takes over and you work together to get through the levels. Alternatively, you can have player two be an alternately coloured Donkey and Diddy and competitively see who can win the game first. To be honest, as much as I love the game, the multiplayer isn’t all that great.